What a difficult time it is for shopping for shoes. 🙁 Shoes need to be made with higher insteps. Any suggestions? I wear a 11W. I understand that you believe the cause of your problem is that shoes do not accommodate higher insteps. But I’m not sure of what the resulting problem is? Do the shoes not support your arches? Do the shoes not provide enough space on the top of your foot, the vamp? If it is a high arch, take this “wet pavement” test: http://asktheshoelady.designershoes.com/category/shoe-fit-2/shoe-fit-healthy-feet-tips/ and follow the tips. If it is not enough space on the top of your foot, you will need to look for specific types of shoe styles that do not cut into the skin on your foot but still hold your foot securely. Lace ups are a great choice. And since menswear styles are such a hot trend right now, you will have lots of choices. Shoes with microfiber or elastic uppers are also a good choice. Tell me more about your problem and I’ll try to be more specific. Thanks for the reply. To clarify, the top of my foot, the vamp, doesn’t have enough room, and I also have wide feet. I am finding due to not having enough room on top of the foot, the shoes are not fitting despite the wide foot. I am so sympathetic. I share your pain. It was years before I realized that I have what I affectionately refer to as a “muscular” foot, ie. thick. And I have a fairly high arch. You must accommodate that width. Think of the shoe as a container holding the volume of your foot. Be rigorous about turning away from those fashionable styles that will bind into the top of your foot. As mentioned, if you want to wear ballet flats and keep them on, they should have a mary jane strap. Otherwise, the wider fit you need will invariably be too wide for your heel and the shoes will slip off. Keep in mind the 28 fit points. Most people just think about length, but that is only one fit point. You need to shoe shop with length, width and front of shoe volume in mind. Remembering 3 out of 28 is not hard. And even if it limits your options, your feet will be happy and that will bring you comfort! Where Are All the Stylish Shoes in Size 12? WHEN DESIGNER SHOES, FIRST STARTED OUT THEY HAD THE MOST STYLISH, TREND, NON- TREND, SHARP SHOES IN LARGER SIZES. I USE TO SPEND HUNDREDS OF DOLLARS AT EACH ORDER… WHAT HAPPENED??? WITH NO DIS-RESPECT MEANT: THE SHOES ON YOUR WEBSITE ARE OLDER STYLES, AND ARE HORRIBLE… THERE’S A MARKET FOR STYLISH, TREND, AND CLASSIC SHOES IN LARGER SIZES WOULD HAVE THOUGHT AFTER ALL THOSE YEARS DESIGNER SHOES WOULD HAVE “GOTTEN IT” GUESS THIS IS WORKING FOR YOU..
Alas …. too bad you can’t walk a day in the ShoeLady’s shoes! 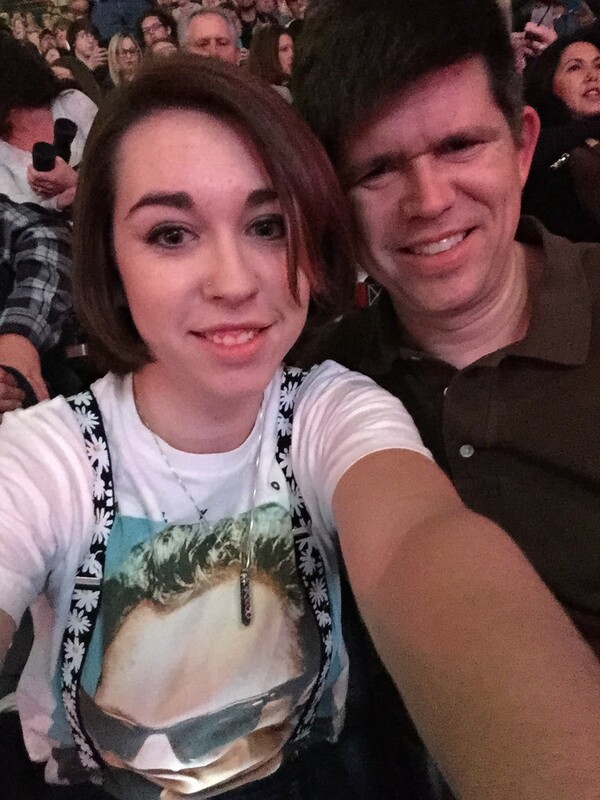 Up and down the aisles with hundreds of vendors at huge shoe show conventions asking…. “do you have styles in size 12”? Years ago it was hard enough to find attractive shoes in larger sizes. And, if you remember, DesignerShoes.com will not carry a brand unless it goes, AT LEAST to size 12! I thought it would get easier as more shoe companies came on line. 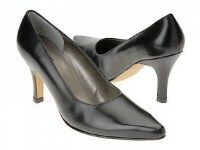 I do believe DesignerShoes.com always had the best “eye” for stylish shoes for “women who leave a larger footprint”. But the companies DSC used to buy from, Vis a vie, Pancaldi, Danny Black, Valentina, the list goes on and on…. They are out of business. The shoe industry is tough. And when the recession hit in 2008 companies that had been in business for almost 100 years did not make it through. Many of these companies closed even earlier as the Euro outgrew the Dollar and made Italian and Spanish made shoes more expensive than USA customers were willing to pay. I fondly remember the days of ordering small batches of a variety of different styles and colors in unique fabrications from companies that were willing to make size 12’s and 13’s… and knew how to do it. The industry has changed. I think DesignerShoes.com does a great job offering styles from the smaller and larger companies that are willing to make these sizes. Maybe when the economy improves, there will be more choices again. In the meantime, the ShoeLady continues to pace the aisles of the shoe shows…. searching. Your prompt response, is appreciated, and Yes, I can understand, walking a day in “The Shoe Lady’s Shoe”s, being , that I am, a business women who, was hit “Hard ” by the recession (regardless of the industry). As I mentioned earlier, I meant, NO-DISRESPECT to You! The average shoes size for young girls not even in high school is a size 10 (USA) , I have a list of over 30,000 young girls , and women who wear size 12-14, and whom, want stylish shoes so, i know, THERE IS A BIG MARKET FOR LARGER SIZE SHOES!!! Guess, I’ll have to find a manufacture, and design my own shoes for females whom leave a larger foot print. I too know there is a HUGE market. And DesignerShoes.com does have some very stylish shoes. They just carry a LOT more styles (4000 compared to about 200) than they used to. And since most of those styles tend to be boring, black and comfort oriented, the fashionable, fun stuff can seem to get lost. I don’t suggest trying your own manufacturing unless you own the factory. I’ve seen too many fail at this… it is very tricky. But mainly, the shoe business has changed. In 1997 DesignerShoes.com could order shoes made in batches of 6 to 12 pair. Now…. 4,000 pair (mixed sizes, same color) is more typical. 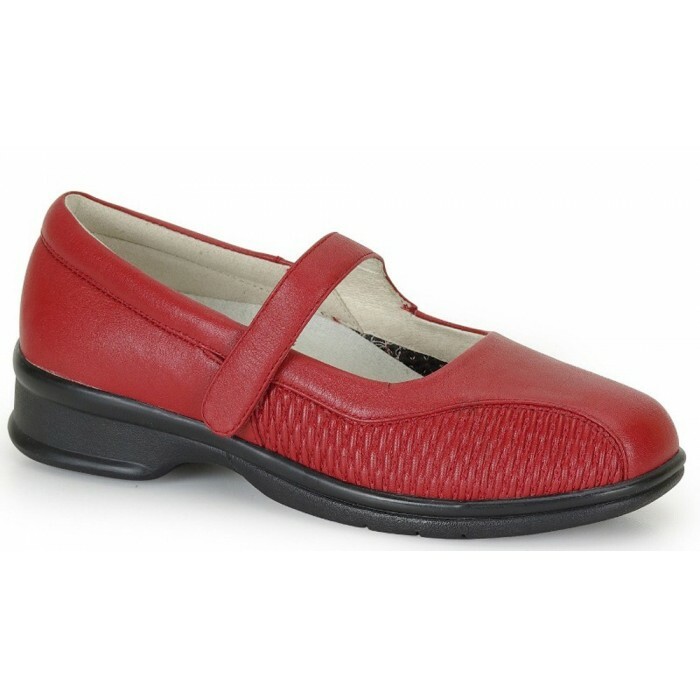 So if you want to offer stylish women’s shoes in a few different styles and colors…. you have to order, at minimum, several hundred pair per style/color. And the fewer you order, the higher the price…by a lot. If you do decide to make your own, let me know. I’m sure DesignerShoes.com would be delighted to carry them! Thank you, Very Much, for your insight !. your product or at least, an “Honest” business partner who, may own a manufacturing plant. You’ll be one of the first person’s I contact. What size should I order? My width is 4.6 and length is 11.2? An excellent, practical question. I assume that you have read how to measure your feet correctly and understand that if you make a little slip and don’t keep the pencil straight up and down, and tight to the edge of your foot, you could end up with a very wrong size. You should be shopping for a women’s 14M, 14 medium. A size 13 is only 1/5th of an inch shorter, 11 inches. If a shoe has an open toe, like a sandal, you may find that 13’s work for you too. After you have asked such a nice simple question, I am loathe to make it more complicated. But much depends on whether you have extra short or extra long toes. A shoe’s size is really determined by the length between the heel and the ball of the foot. So if your toes are disproportionately long, you’ll be buying a shoe that doesn’t quite hit in the right places around the ball of your foot. Ah. TMI. Too much information. Take a look at these styles. http://www.designershoes.com/all-products?sizewidth=131 Size 14 shoes that look like women’s shoes are infernally hard to find. There are 154 styles today from 13 different brands. I’m a size 12 and I HATE my feet. Everytime I see a shoe that I LOVE, they obviously don’t carry my size. So where can I purchase cute shoes online? Also what would be my size when it came to wanting to wear heels? I’m not asking you to love your feet. But you can at least be kind to them. If you are going to be angry, then be angry at the folks who don’t make shoes in your size. It is not the fault of your feet that you can’t find size 12 shoes! Not that I’m not sympathetic. As a size 11.5 myself, I wear size 12’s a lot. If you think size 12’s are hard to find, try looking for an 11.5. But let’s get right to your question. You can purchase size 12’s on line here: http://www.DesignerShoes.com. You can probably find them other places too. 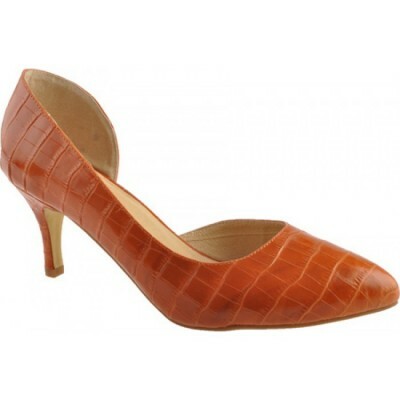 But DesignerShoes.com does not annoy you by carrying all those styles that stop at size 10. The size 12’s sell out fast, but the site is filled with, as of today, 1.705 choices. http://www.designershoes.com/all-products?sizewidth=129 Since it is the very beginning of Fall, new styles are arriving all the time. Developing your personal style will make you a fashion leader. Decide what shape and style of shoe looks best on your feet. What styles go best with your lifestyle. You mentioned high heels. If they are properly sized, you would wear a size 12 in heels too. But for heels, knowing your correct size and width is more important. There is less, shall we say, “wiggle room” if you get the measurements wrong. You may decide that a flat mary jane style in a bright color with striped opaque tights makes the perfect fashion statement for you. Or you may prefer a stiletto ankle boot with a platform sole and blue jeans. Whatever your style, treat your feet well and they will make you happy. When I was a freshman in high school back in 1984 I was already a size 13M. Like most women, there was not a shoe that I didn’t like. Unfortunately my size was very hard if not impossible to find. When we did find a store that carried shoes in my size the selection was usually only one of two shoes in black, blue or brown. (Nothing like designershoes.com, where were you 20 years ago???) It was constantly disappointing to go new shoe shopping. My freshman year, my parents really wanted to send me to Catholic school. I had my own ideas and was really set on going to the local public school because I had been in parochial schools since I was 8. This was to be my first chance at freedom in a public school. My parents took me shoe shopping for the upcoming school year. We came into Boston to the only shoe store at the time that carried size 13. 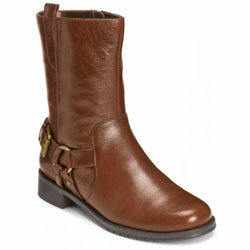 When we were there, I found these beautiful brown, soft leather boots that I absolutely fell in love with. The problem was that they were over $100 and my parents did not want to spend that kind of money (in 1984 that was even more than today) But, they relented if I would change my mind and go to Catholic school. I thought, “I’ll agree to go, wear them the first day, then go back on my side of the deal and continue to go to the public school I was already enrolled in. Since I will have worn the boots, there would be no way my parents could return worn boots. My plan backfired. My parents sent me to Catholic school in my new boots and 4 years later I was still there wearing them. Is there nothing a girl won’t do for her favorite pair of shoes or boots?